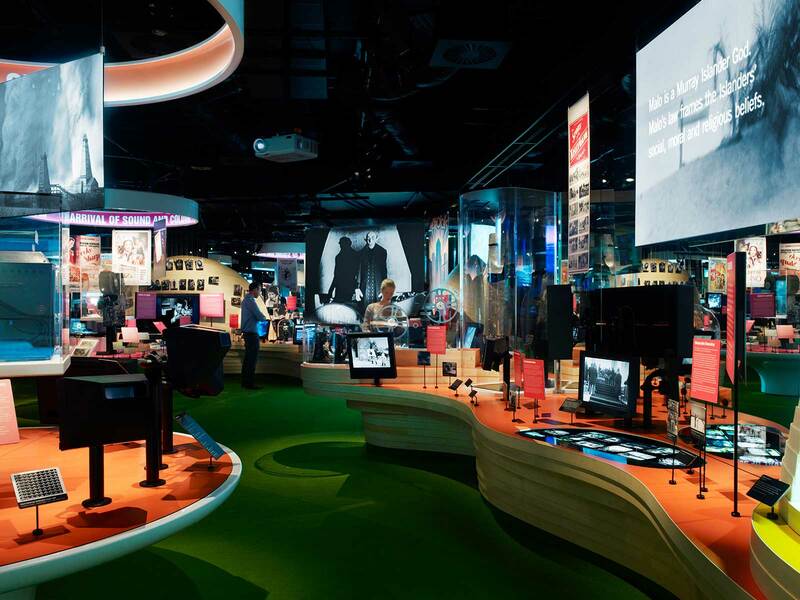 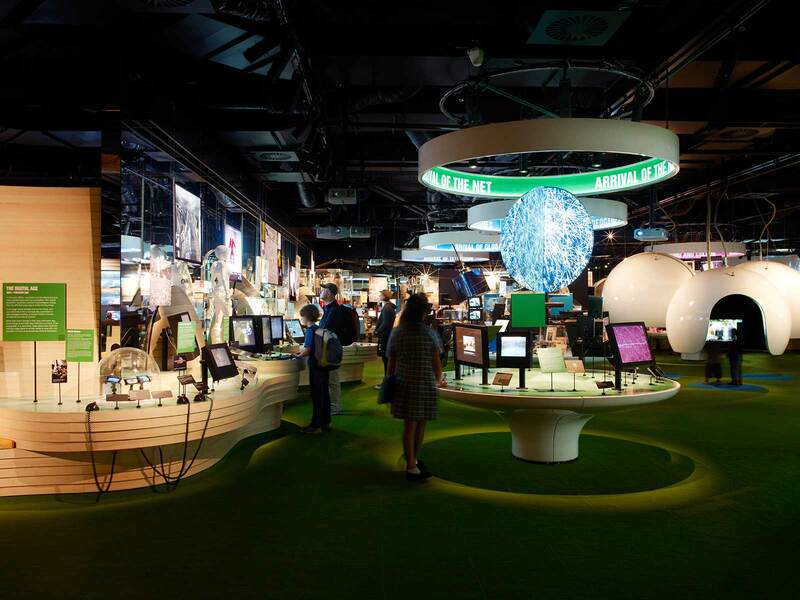 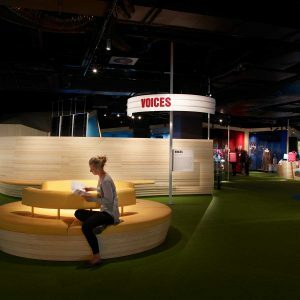 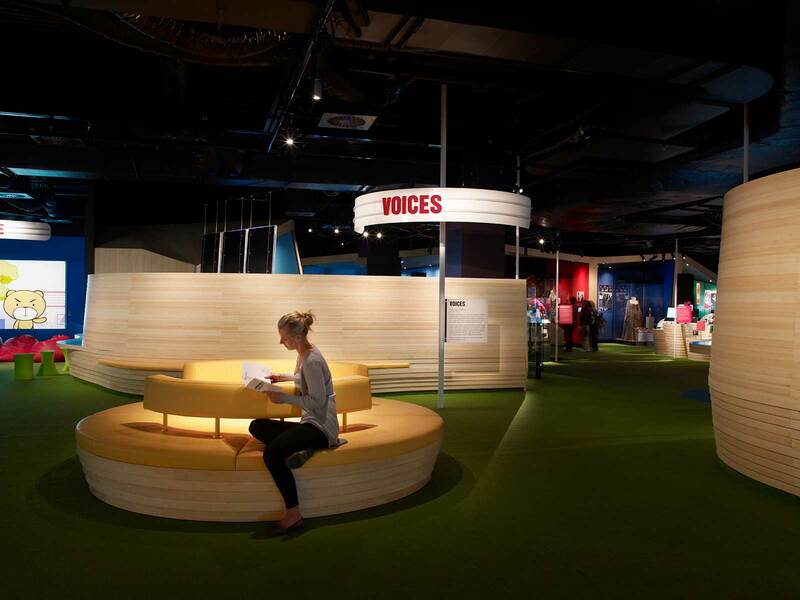 Brief: To revolutionise the public offering at the Australian Centre for the Moving Image (ACMI) in Melbourne, re-designing the venue’s façade and public spaces and creating a striking new permanent exhibition about moving image culture called Screen Worlds. 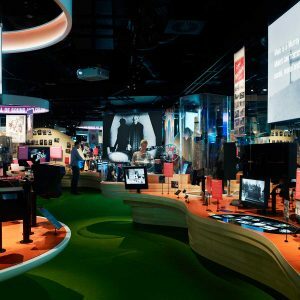 World leading and state-of-the-art, the Australian Centre for the Moving Image (ACMI) is acknowledged as an outstanding and state-of-the-art institution in its field, celebrating and exploring the moving image in all its forms. 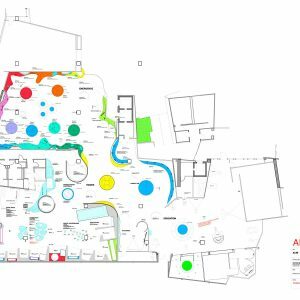 Ab Rogers Design won an international competition to reconfigure the major galleries and their associated permanent exhibitions and function spaces. 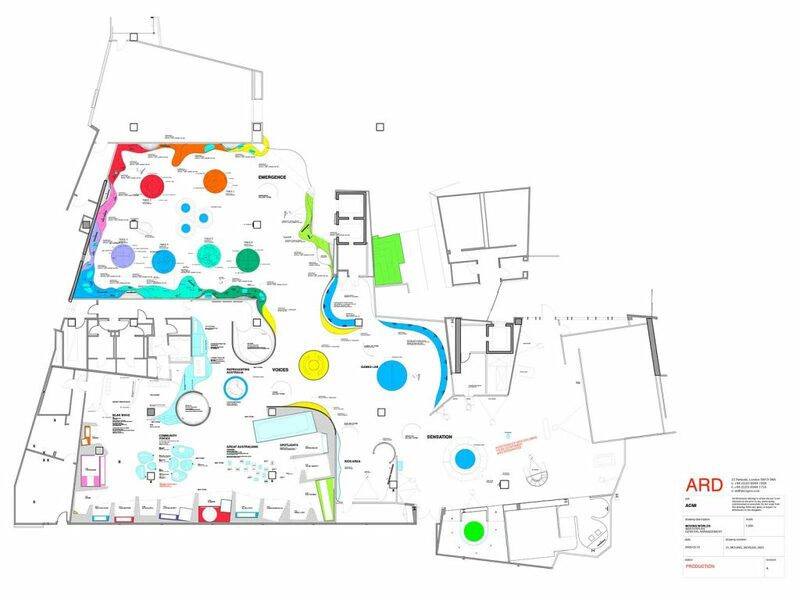 In addition we also completed a masterplanning study of the museum, identifying the need for the re-structuring of its circulation and the creation of a new, dedicated entrance to the galleries. 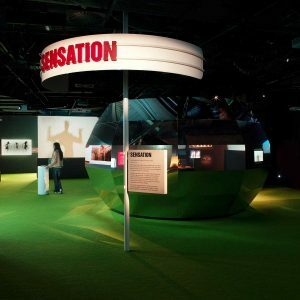 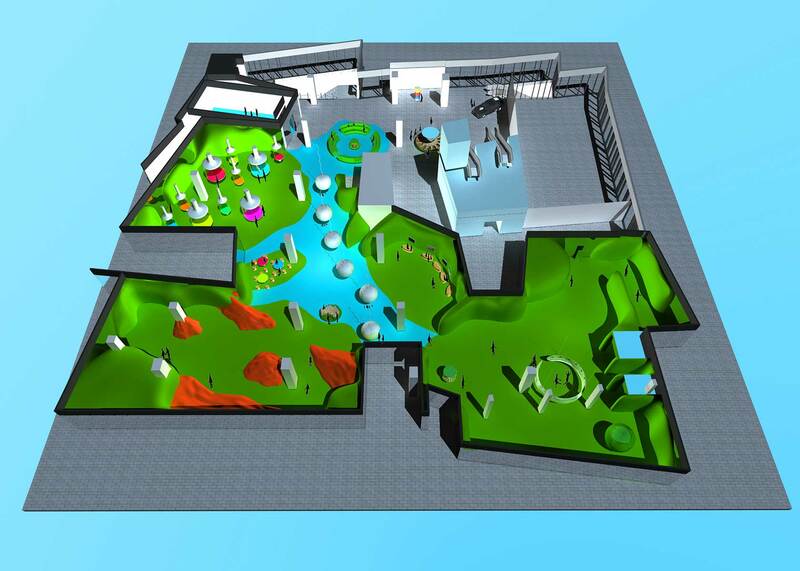 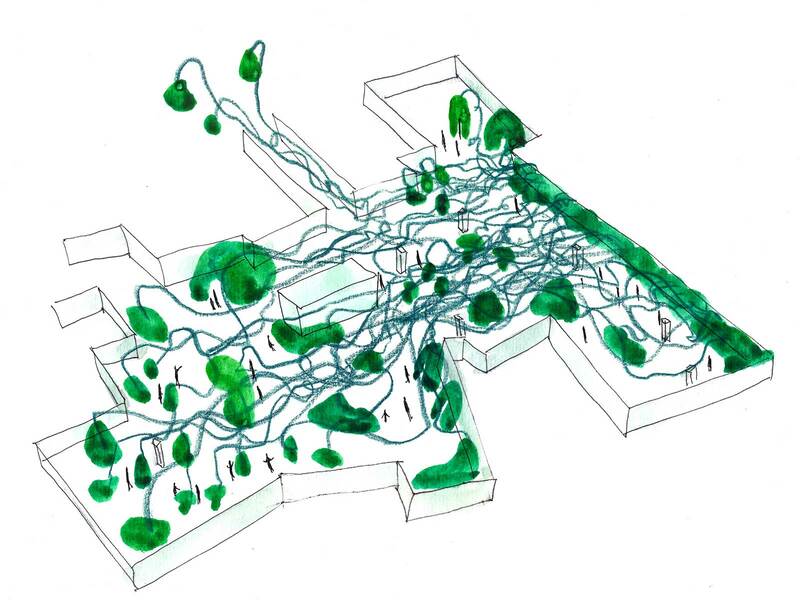 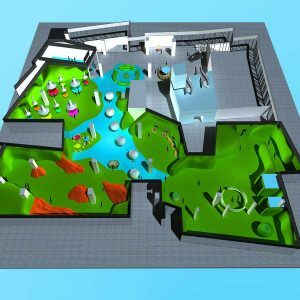 Our design concept for the permanent gallery was to create a singular but flexible flowing landscape of forms, able to support and unify masses of content (over 1000 film clips and 250 objects), from scripts, film props and costumes to digital interactive exhibits within three distinct zones – ‘Emergence’, ‘Identity’ and ‘Sensation’. 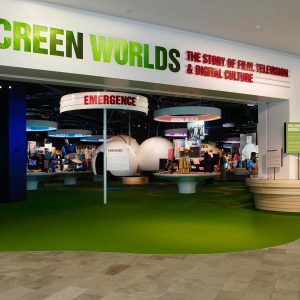 Drawing inspiration from the dramatic beauty and organic shapes of the Australian landscape, we transformed ACMI’s ground floor gallery into a fantastical and immersive environment with lush green flooring, sweeping bamboo forms for plinths and display cases and suspended pods housing dazzling film installations. 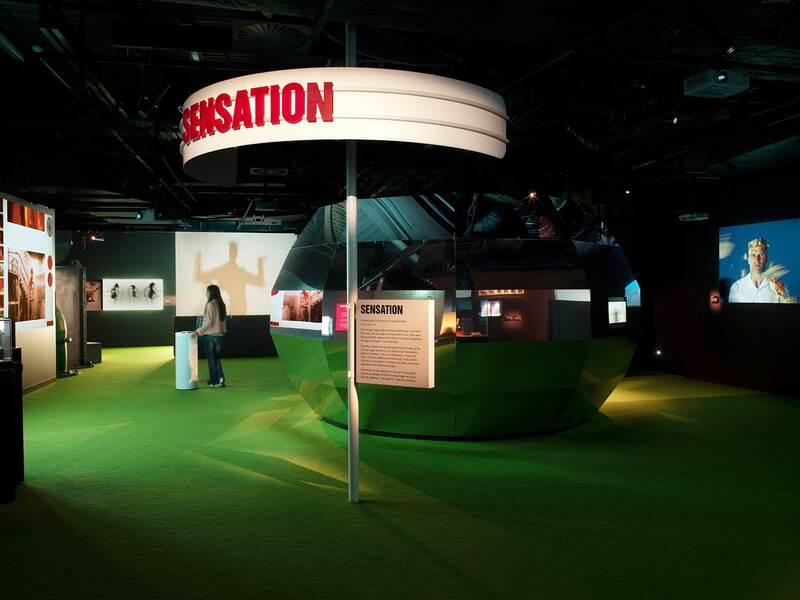 This created a culturally resonant backdrop for exhibition content and provided a defined visual language to aid interpretation and tie the large quantities of disparate exhibits together. We built up the narrative context of this landscape by applying a tactile, multi-textural palette to reflect the diverse content strands and offset screen glare, specifying a broad range of materials from natural bamboo, woven textured carpet, fiberglass, recycled fibre acoustic boards and traditional automotive leathers through to architectural cladding metals. 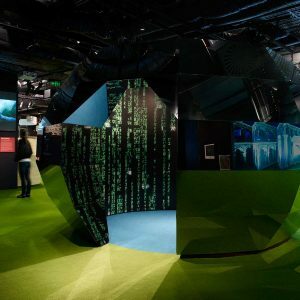 Moments of intimacy were introduced within the large open-plan space, giving visitors time to pause and develop a response to the content; these included immersive caves carved out of the landscape and ‘micro-cinemas’ within suspended pods to allow personal interaction with the visual material. 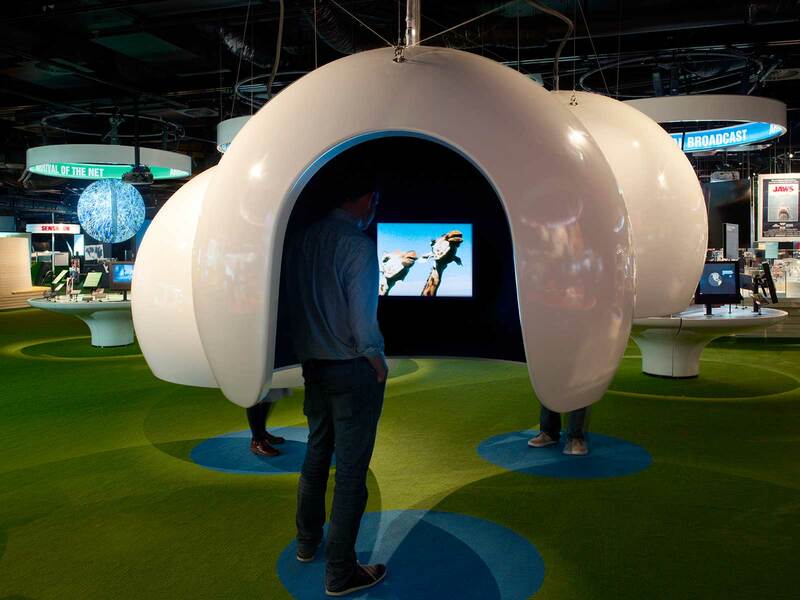 Audio, visual and objects can also be taken out into the space with local sound, hand-held speakers, acoustic and light-controlled spaces and individual screening units all contributing to the creation of a rich multi-sensorial landscape. 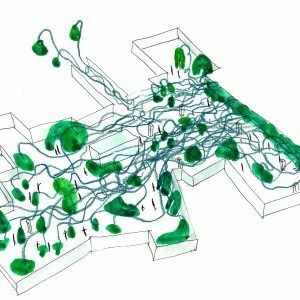 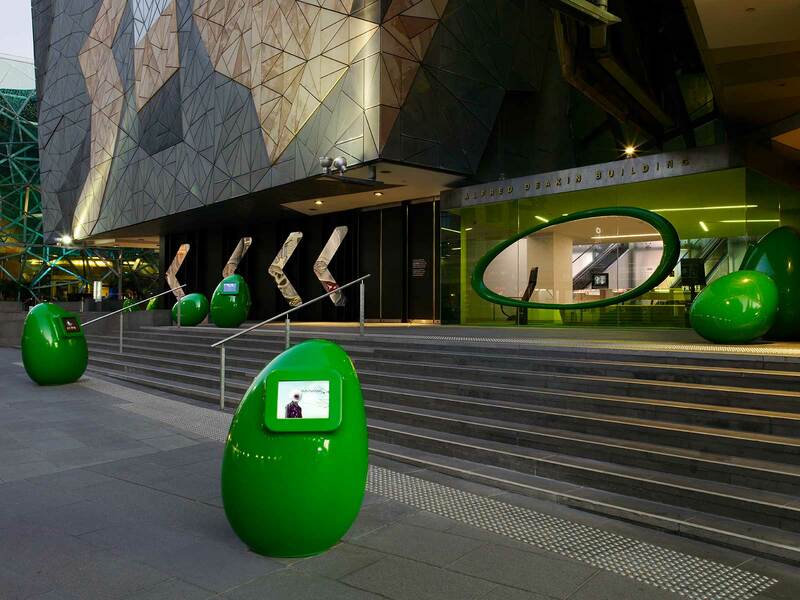 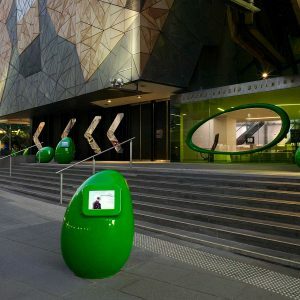 To entice visitors into the museum, we developed a series of interactive furniture pieces – or ‘friendly green blobs’ – that were first encountered outside the building and in other public parts of the building, leading the way to the main exhibition like a breadcrumb trail. 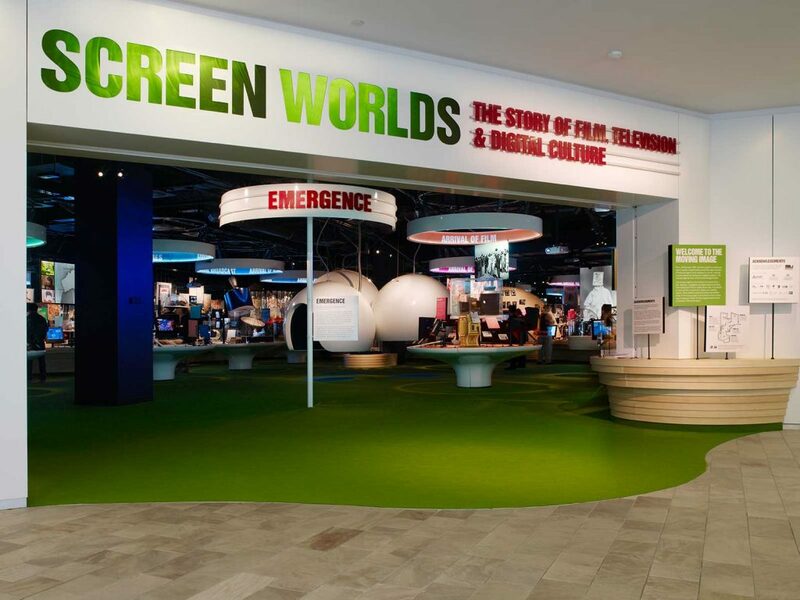 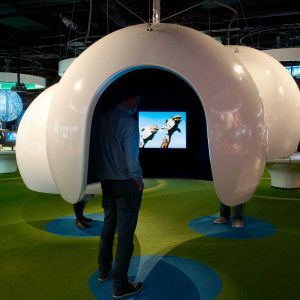 These offered an array of videos and games, acting as ‘Screen World’ exhibition teasers, allowing it to flow into other spaces. 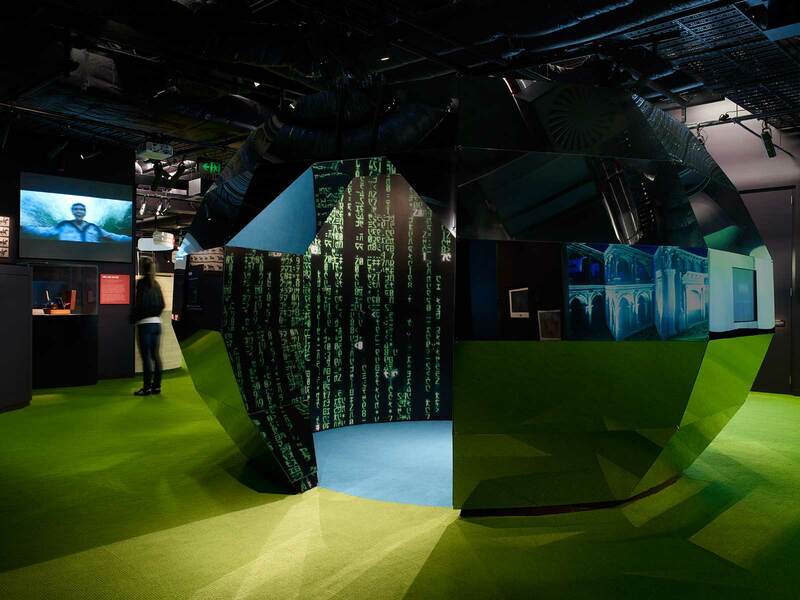 We further animated the venue’s façade through the introduction of a vivid portal and a series of porthole windows to offer a tantalizing glimpse of the colourful delights inside. 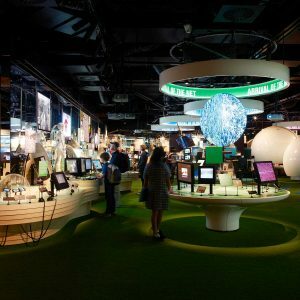 The success of this strategy was born out in the visitor statistics for the first year which included a record figure of 2218 visitors in one day as well as high numbers of repeat visitors.